Civilisations were born and prospered on the banks of rivers. Rivers have been the lifeline not only for humankind but for the entire ecosystem. From their origins mostly in the mountains and before they meet a larger river or the sea, rivers have satisfied the thirst of millions of living beings. As humans progressed, rivers have also provided water for irrigation, for industrial use and for construction. In fact, history tells us how some civilisations collapsed when their primary rivers changed course or dried up. 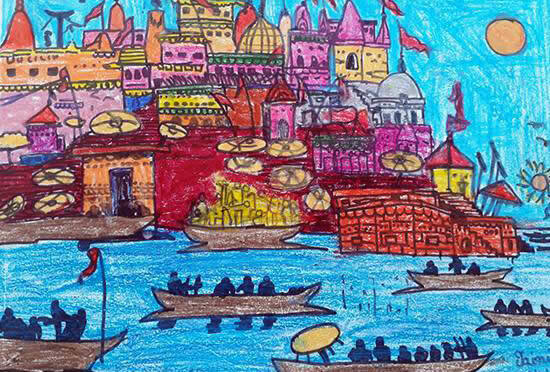 Khula Aasmaan urges children and young adults to go the river and express themselves through art. You can choose any river - small or big near you or you could travel a distance to see a river which you always wanted to experience. You could go to the place where the river originates, travel along the course of the river and see different cities and towns and their people and finally see the place where the river meets a larger river or the sea. Each place has a different beauty and a different song. Sing that song. Children (5 to 15 years) should send their Sketches & Drawings, Paintings, Cartoons, Collage, whereas young adults (15 to 25 years) should send their Sketches & Drawings, Paintings, Cartoons, Comic Art, Posters, Doodles, 3D Art on paper, Photographs (camera and cellphone), Digital Art (any artwork created using digital tools).